One of my good friends from graduate school spent a lot of time in El Salvador and loved it, so I really wanted to follow suit. And, in fact, there were some parts that I really did love. But there were also some parts that I wasn’t crazy about. For the last nine years, Bill and Jean have done a phenomenal job organizing the El Salvador Rally. Similar to the Baja Ha-Ha, the El Salvador Rally is intended to create community amongst cruisers, bringing people on a similar schedule together for happy hours and social activities. The El Salvador Rally is more loosely organized than the Ha-Ha, since boats are often on staggered schedules. All in all, there were about 50 boats that participated, and we got to meet about a dozen of them in the Bahía del Sol marina, where we docked. In particular, we spent a lot of time with our good friends Nick and Allison on S/V Salt. We shared a rental car with them for a week, which allowed us to run some errands in town and do some sightseeing. We enjoyed checking out the Joya de Cerén Archeological Site, a pre-hispanic farming community that was buried after an eruption of the Laguna Caldera volcano. We also hiked Puerta del Diablo (Devil’s Door), which I was so excited about. Unfortunately, it wasn’t great. The view is beautiful, but there is trash everywhere. It was hard for me to stomach. The beautiful view from Puerta del Diablo (you can see some trash in the foreground, but on the trails it’s even worse). Bahía del Sol marina is part of a resort that generally caters to locals. It’s low season right now, so the resort was far from maximum capacity, which made it really nice to enjoy happy hour at the pool. The downside is that the marina is far from everything, which meant that without a rental car it took Philippe nearly an hour on a hot bus to get into Zacatecoluca, the closest town (which isn’t very large). In my opinion, the best thing about driving to Zacatecoluca is that you get to stop for ice cream at POPS (also called Boston Premium Ice Cream). It was easily the best ice cream we’ve had since leaving the States, and they even had dip tops (called cappuccinos). We spent an afternoon exploring the mangroves in Untethered. 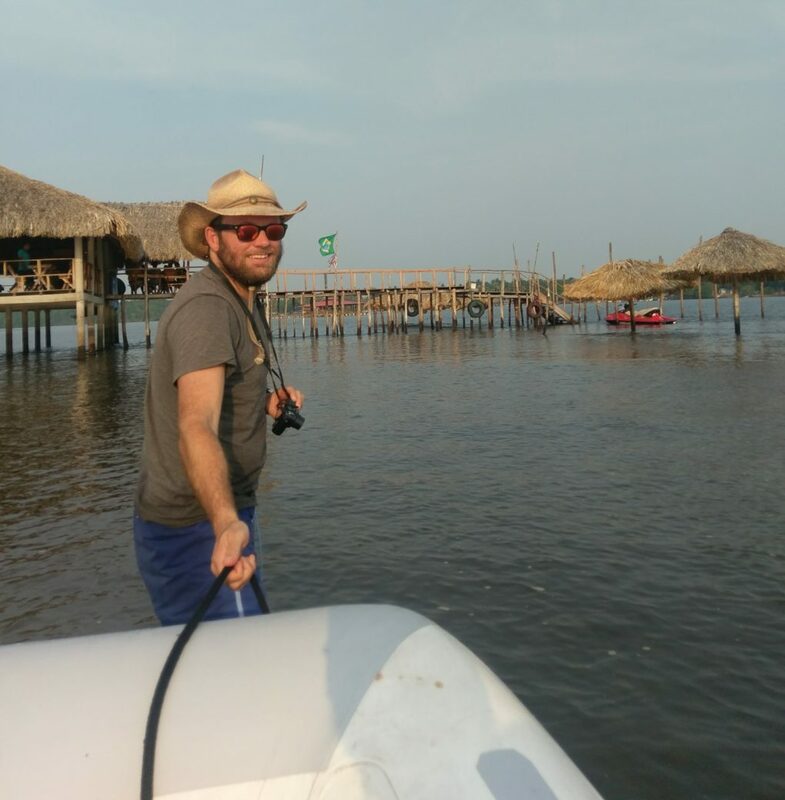 …And ran into a sandbar outside of El Capitán, a palapa restaurant that can be reached only by boat. The food here was great and the owner was super nice! As part of the Rally activities, we also attended the annual Mango Festival. It was a big deal for the local community, and our group was the only group of gringos there. People seemed to enjoy watching us walk around and try different foods. We got lots of smiles and waves. Philippe’s shamelessness comes in handy in countries where beards (especially large red ones) aren’t common. People will often stop and ask about it or comment on it. At one point we were eating lunch when two 9 year old girls ran over to us and told us that they loved our hair. One girl gingerly touched my short haircut, and the other thrust her hands deep into Philippe’s beard, giggling the whole time. It was super cute. Keith is convinced that Philippe must have had the biggest beard in all of El Salvador. Drinking mango juice at the Mango Festival. A number of people have asked me if El Salvador is mostly just an extension of Mexico; if, in actuality, they feel like the same place. The answer is: no! There are some similarities, but you can definitely tell you are in a different country. It’s very smokey, especially in the mornings. People burn their trash, which fills the air with a thick smoke. On more than one occasion I went for a run, but had to turn around because it was too hard to breathe comfortably. Car rental in El Salvador is a breeze! No expensive insurance requirements and unlimited drivers. More men carry machetes, fewer men carry guns. People are still super friendly. Pupusas with friends from the El Salvador Rally. Bill and Jean organize this outing every Saturday, and are good friends with the woman who owns this house and makes the food. Cell phone connectivity – This was our first stop where I couldn’t use my Verizon plan without activating the $10 / day Travelpass feature. Luckily, a trip to the Claro store in town could get you a 10 GB SIM card for $10. This data only card, paired with a google voice number that let’s you make calls over Wi-Fi or a data plan, made calling a breeze. The quality of the call over the data plan is fantastic. Wi-Fi – The marina Wi-Fi was mostly fine. We had to use our booster to get it on the boat, but many boats that were closer to shore skipped their boosters. There were a few spotty patches when we used our cellphone hotspots, but the Wi-Fi was generally fast enough to get everything done. Restaurants – We ate lots of good pupusas, but for something a little different we loved Kreef. It was a German restaurant, and we got so much good sausage and cheese. We also loved El Capitán, which can be reached only by boat, but has great food and a super friendly staff. Things to do – A 5-day car rental only costs $30/day, and they drop it off right at the marina. Joya de Cerén is super interesting, but it only takes 30-minutes, so it’s best to plan a few other excursions in San Salvador. A dinghy ride through the mangroves is also a lot of fun – the estuary is beautiful!